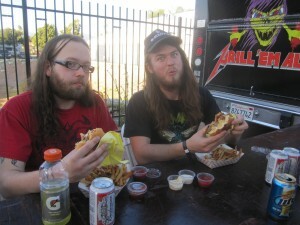 In 2009, the metal brethren and I ventured to the land of Atlanta for the first Scion Rock Fest where before and after the show, I held a massive 2-day Burger Conquest at the truly awesome Vortex. 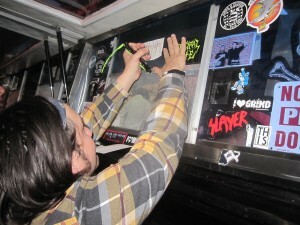 In 2010 we hopped into the SlayRV to attend the 2nd Annual Scion Rock Fest in Columbus, OH. 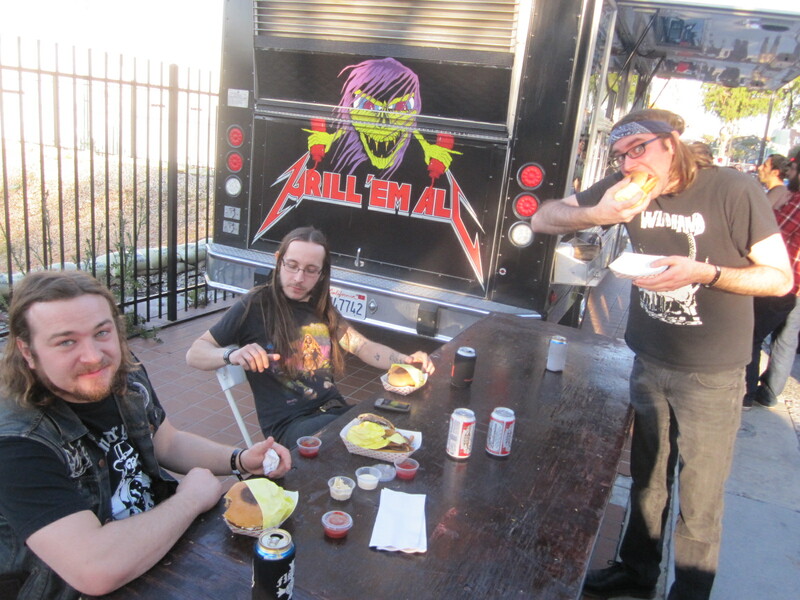 There we held another metal Burger Conquest at the famous Thurman Cafe. Enter 2011 and this year the amazing and free metal festival known as the Scion Rock Fest announced they would be holding this year’s event in Pomona, CA. The moment word of these super radical mosh-fest graciously paid for by the Scion car company hit my inbox, I immediately started to think of places where we could keep the metal Burger Conquest tradition alive. That’s right when the request came in. 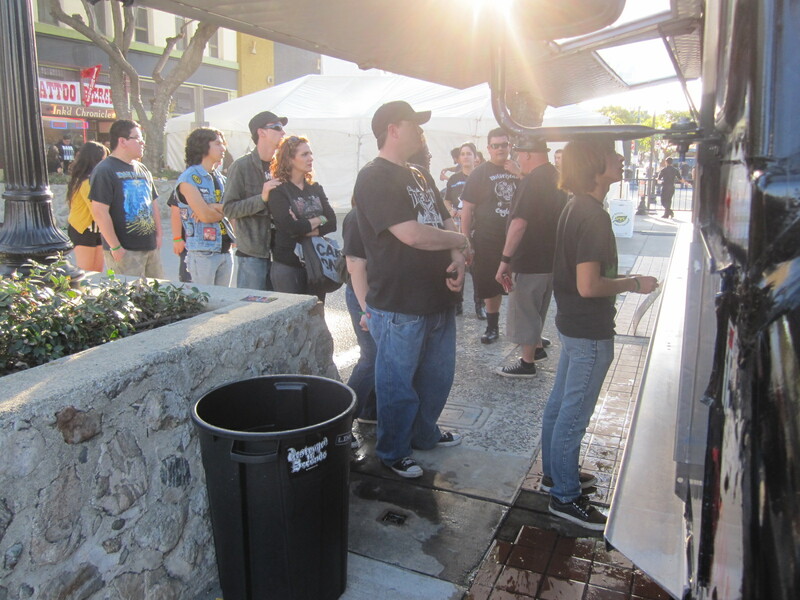 The Scion Rock Fest was asking the LA based, heavy-metal themed, gourmet Burger Truck and my business clients, Grill ‘Em All if they would like to provide the food for fest attendees. “It’s funny how life imitates art,” or is “if you build it, they will come?” Either or, they both apply. The story gets deeper. 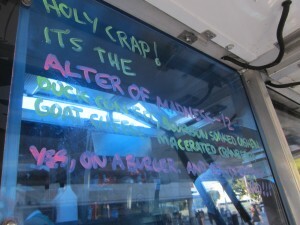 Not only did it make perfect sense for the trucks to be serving their head-banging brand of Burgers at this amazing festival but there was something bigger afoot here. 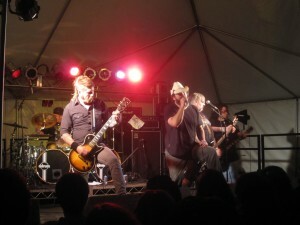 One of the 4 stages at Scion was to be headlined by the band Municipal Waste. 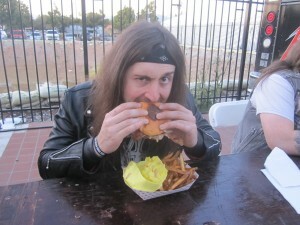 Their face-ripping brand of thrash was Chef Ryan’s inspiration when he created the Waste ‘Em All, a Burger topped with Green Chilies, Pepper Jack & Beer soaked Onions. 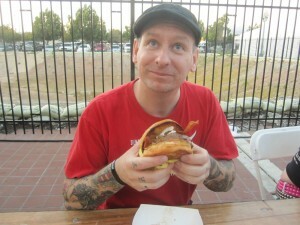 As return gesture of Burger Appreciation, their drummer Dave Witte, perhaps one of the most talented and equally insane skinsmen in the world, offered to create a Burger for the Grill ‘Em All menu. 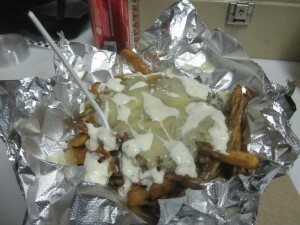 Thus was born a Burger that matched Dave’s skill set and mental edge, the Witte; (pr. 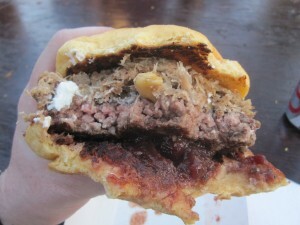 Wit-e) a Burger covered in Cream Cheese, deep fried Bacon, Beer & Sriracha soaked Onions & Malt Vinegar Aioli. 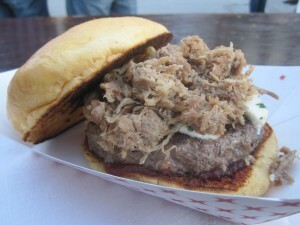 It’s pure unadulterated Burger goodness gone mad and I guarantee you will love it. 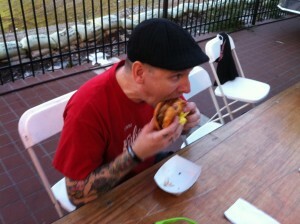 But the best part … Dave Witte has never eaten his own Burger from The Grill ‘Em All Truck!!! The man, the myth, the legend, the stretched polyester pounding maniac with a penchant for Burgers as crazed as his playing style, looked like a kid on Christmas Day morning discovering the Red Rider BB Gun that Santa Claus has brought as he plowed through his name-sake creation. 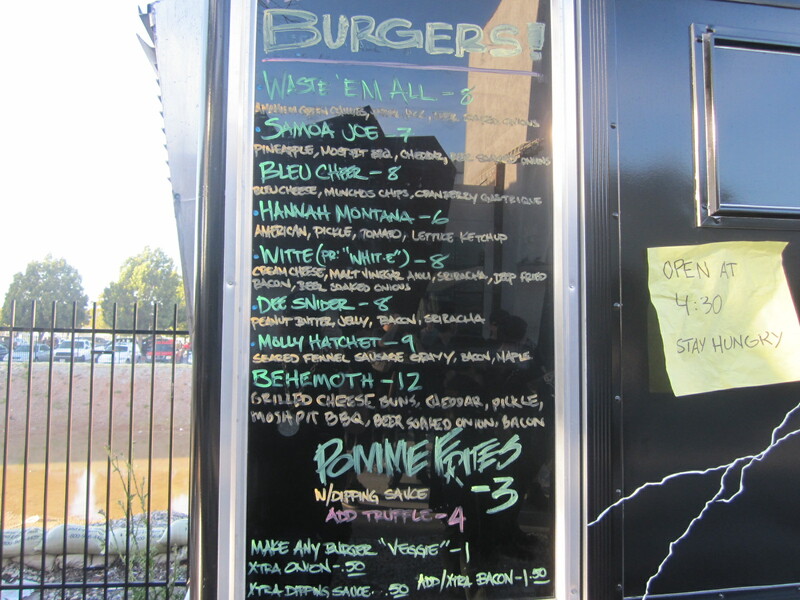 It brought a little tear to my eye and at the same time made me a little jealous that I haven’t developed the musical skills that would earn me an item on the coveted Grill ‘Em All Burger menu. The entire band joined Dave on for his triumphant moment of meta-Burger eating, each of them devouring a selection from the trucks. 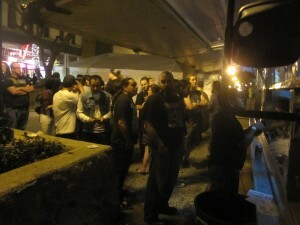 Later on that night, they went on to play one of the BEST sets I have ever seen them play. Was it the Burgers? Well, it’s a little too late to call in the medical examiners on that one but I don’t think there’s a soul that could completely refute the idea. 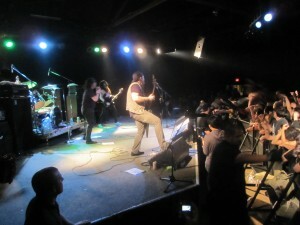 Their thrashtastic madness sent the entire Glasshouse into an hour long fit of headbanging, moshing and taking it to the face. You see, not only can the MW guys rip up some sick riffs and nasty mosh parts but they know how to keep it fun because life is supposed to be a good time. Fueled by rad Burgers and cold beers, there’s no way you could have a bad time at one of their shows. 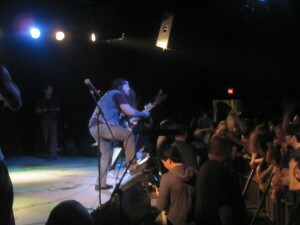 Just ask Chef Ryan who due to the electricity in the bar, lost control of his composure and took a wicked stage dive during the band’s set. 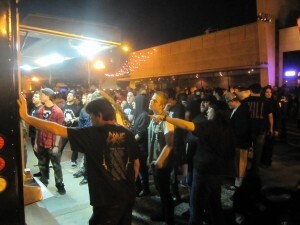 The entire event was a raging good time out in the California sunshine with a ton of excellent bands including one of my favorite performances of the show, Primate. This grinding speed beast features the talents of vocalist Kevin Sharp from Brutal Truth and Bill Kelliher from Mastodon. 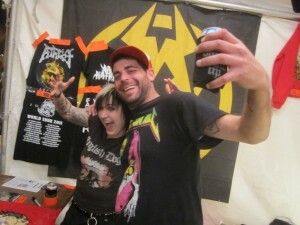 They played in the tent directly behind Grill ‘Em All’s Son of Beast so we all took a moment away from the trucks to enjoy their face-ripping brutality. 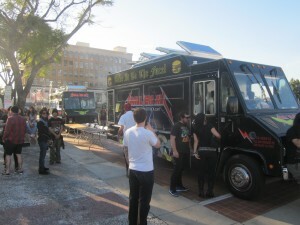 But then it was right back to the trucks where the hordes of hungry headbangers who were looking to grow their bodies with Grill ‘Em All Burgers were not letting up. This entry was posted in Burgers, Event, Gourmet Burgers, Los Angeles and tagged altar of madness, burger, burgs, ca, california, cheese, ciancio, confit, conquest, cough, crush, food truck, french, fries, glasshouse, great, grill em all, grill em all truck, hamburger, meet and greet, morbid angel, municipal waste, new york, ny, nyc, pomona, rev, review, rock fest, rockfest, scion, the, witte. Bookmark the permalink.